White Owl Medicinals is an herbal medicine clinic and apothecary located in Marquette Michigan. The apothecary offers private health consultations, personalized herbal remedies, workshops, medicinal and edible plant walks, loose leaf tea, simple herb tinctures, art, and various wares. For more information on what the apothecary offers, go to the Apothecary and Consultations, sections of the website. White Owl Medicinals is the answer to a long envisioned desire to connect science, medicine, and magic. The feeling you get when you see old and mysterious things, walk into sacred places like forest groves or antique book stores. There is a touch of reverence and excitement and somehow a mix of seriousness and playfulness. I wanted to capture this feeling in my art and my medicine. To me, medicine and magic are finding the will to carry on and heal yourself. To hold onto something and believe it can help you. To know that you have everything you need to get through the storm, but sometimes it feels good to put a little of that energy into a stone, a feather, a cup of tea, and allow that object to remind you of what you’re capable of. Sometimes the apothecary will help with a stubborn cough by using garlic because it is a scientifically researched mucolytic (breaks up mucus), and respiratory disinfectant. I’ll site research, and use more clinical terms. On the other hand, sometimes the situation is not as cut and dry. Sometimes someone can be dealing with something as ephemeral as fear… or collective sadness. In these cases, sometimes someone needs to be handed a small warm river stone to rub in their pocket and remind them of the earth, and sip a tea with things that wrap the heart in a sense of safety, and a little vial of tincture that can calm nightmares or dark daydreams. Things like this call upon an older and deeper side of ourselves, and can give us just what we need to help pull ourselves back up again. If someone wants to speak scientifically and clinically, I will speak this language, and if someone is open to something that is a mix of science and magic, then I am all too happy to reveal the energetic side of herbal medicine. There is room for both at White Owl Medicinals. The story behind the name of the apothecary developed over the year in which I was searching for my herbal education. Every decision I have made in regards to herbal medicine has been answered by an owl. 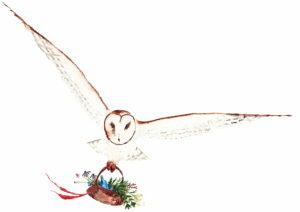 When I first started the Rosemary Gladstar course, I saw my first wild owl while kayaking solo on an inland lake. When I choose to go to England, I found my first owl feather resting gently on my deck. When I choose to go to Pacific Rim, I found another owl feather while hiking, and then I found a whole owl wing down by my favorite beach in Tahoe. Since then, the feathers have kept coming, and when I see one, I know I’m on the right track. I find connection with a lot of different animals, but accepting the owl as a mascot and ally feels particularly appropriate for me considering I have a special interest in sleep and dreaming, and I always felt that the owls watched over me while I slept, keeping me safe while I dream. *Please see the FAQ section if you’re unfamiliar with the word “apothecary”. I, Sky Richarde RH (AHG), am not a doctor, and as such, I am not going to diagnose, treat, or cure any conditions. I am here to assist in the healing process and I will not hesitate to refer to other practitioners and doctors if and when it seems appropriate. Just because I am in the natural health care field, does not mean that I am against modern medicine in any way. On the contrary, I believe in complimentary medicine, and strive to work with doctors to do what is best for each individual. Many herbs can work alongside modern medicine, and can even make certain treatments more effective. I would like to help bridge the divide between herbal medicine and modern medicine, being trained in herb/drug interaction has helped make this possible among other things. I have met good doctors and bad doctors, just as I have met good herbalists and bad herbalists. Finding the individual who fits your needs is the key, and everyone of us is a complex and unique lock. Sometimes it’s harder to make things short and sweet than it is to make them long and thorough, but here we go! I am an herbalist, artist, crafter, cook, adventurer, wild water swimmer, circus person, explorer, writer, singer, and vivid dreamer… among other things. It is hard to separate these passions, so I often do not bother. Herbalism for me has been a path of following passions and joys and it has lead me on a journey of better understanding my own body and parts of the world. 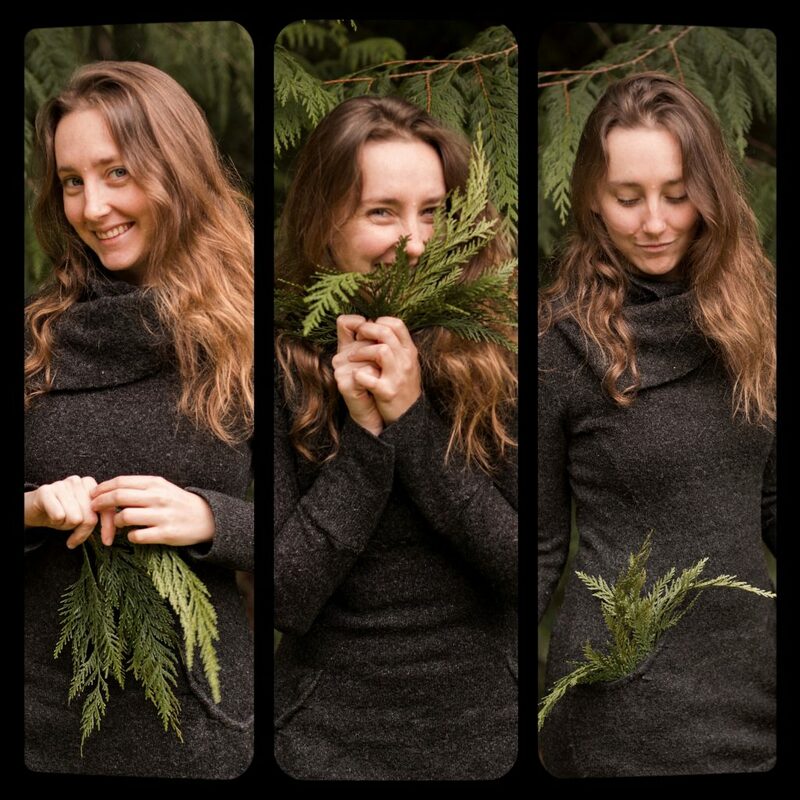 As an herbalist my greatest desire is to help people better understand themselves and their body, to connect to things that remind them of what being truly human is all about. I want to empower people with the knowledge of their health so they never feel lost at the whim of a caregiver and unable to make the right decisions for themselves. I love introducing people to new flavors, experiences, and a world in which science and magic live side by side. Where one can feel deeply and think critically, walk through the forest and listen to the plants with your heart, and explore them with your mind. I enjoy the history and mythical uses of plants, just as much as I enjoy the practical and medicinal uses of them. You’ll notice that a lot of my products tend to lean towards the more magical realm of things, this is in part because of my curiosity and joy of these subjects, and also because this realm is a little more flexible than the medicinal one. My medicinal products are highly individualized, and my training -along with the laws governing herbalists- have taught me to only create medicine for one person at a time, and only after learning who that person really is and what their body really needs. I have a special interest in sleeping and dreaming, because I feel that this is a realm in which the two worlds of science and magic overlap the most. Where one can see the interplay of brainwaves and hormones along with the plants that can assist these systems, while at the same time observing the archetypal, metaphorical, sometimes literal, and sometimes prophetic world of dreaming, and how herbs can influence this. I favor herbal medicine that picks up where modern medicine leaves off or cannot really help much… and the world of nightmares, sleepwalking, night terrors and other troubles of the sleeping mind/body is a perfect example. American Herbalist Guild Registered Herbalist (2018). Without regulation, American herbalists are held to the standard of the American Herbalists Guild, which has strict educational, ethical, and continuing education requirements for it’s professional members. There are other herbal professional associations throughout North America which also have high standards and wonderful practitioners within them, but since I travel between the US and Canada the AHG was the most appropriate for me. Diploma of Phytotherapy, issued by Pacific Rim College, 2017. This is the most comprehensive course in Western Herbal Medicine offered in North America, held to the standards of England’s regulations regarding Phytotherapists. England is one of the few countries which regulates herbal medicine and recognizes it as a legitimate health practice. The Science and Art of Herbal Medicine. 50 hours of Advanced Wilderness First Aid. A Holistic Approach to Post Traumatic Stress Disorder 2016: Where we dove more deeply into states of PTSD and what herbal support may look like. Inclusiveness in the Clinical Setting with Bryn Eliot 2016: Where I was mentored on how to create a safe, welcoming, and professional environment for people within the LGBTQA++ community. Medicinal Mushrooms with Robert Rogers 2014: Where I was introduced to the variety of local mushrooms on Vancouver Island, and taught safe practices for harvesting, and using them medicinally. Healing the Emotional and Spiritual Aspects of Dis-ease with Robert Rogers 2014: Where I was trained in the use of flower essences, and good patient communication, with an emphasis on emotional needs. Reading the Body with Margi Flint 2014: A course focused on observing patients in the clinic and knowing how to spot physical markers for deeper states of disease or distress. Materia Medica of Local Plants with Robert Rogers 2014: An extended course on local plant medicine. The Art of Distillation 2014: A course on distilling plant hydrosols, what to look for when purchasing quality and medicinal hydrosols, and how to spot good professional practices. I’d like to thank some of the teachers that have made my path possible. ~Lindsay Hounslow, who taught me how to quiet myself enough to listen to the plants with my heart. ~David Caudwell, who on more than one occasion made me cry with compassion as he spoke on the beauty and mystery of the human body and the phases it goes through, as well as laugh and laugh and laugh at the most ridiculous and brilliant jokes a classroom could experience! He taught me how to be a better listener and practitioner. ~Sean Donahue, who taught me that within all magic is science, and within all science is magic, and to trust my intuition. I’ll never forget the tangent during one class that lead to the ins and outs of a proper invisibility spell, it was at this moment that I realized that yes, in fact, I had enrolled in Hogwarts after all! ~Peter Conway, who encouraged me to follow what had only been a dream. ~Bryn Eliot, who used some kind of magical power to get me to absolutely LOVE biochemistry and phytochemistry. ~Jamie de Melo, who used absolutely every tool in the book to make Anatomy, Physiology, and Western Pharmacology somehow understandable and memorable. ~James Christian, the amazing Dean of my college, who also taught my first potions class at PRC and shared an infections passion and love of plants. ~Krista Dawn Poulton, who taught me advanced potions, and showed me that it was possible to do all of the things I wanted to do, she is an inspiration as the herbalist I aspire to be. From my personal life I would like to thank…. ~Dawn, who somehow managed to nail being a mom, a freaking incredible healer, as well as a teacher and a best friend… how in the world did you DO THAT? I can barely keep my house clean AND myself fed. ~David, who was my philosophy teacher, history teacher, debate professor, fact checker, English lit teacher, adventure specialist, and who taught me practical things like how to catch a fish, solder a broken pipe, paint a house, build a house, and tend a good fire. ~Christaofer, who taught me how to push myself, get out of my comfort zone, go beyond what I thought I was capable of, and managed to save my life at least once, all before the age of 12! Thanks bro. ~The Bush-Baker family, who taught me things like canning, bread making, winter survival, and much, much more. ~Sue, who taught me how to make maple syrup and care for the trees respectfully, who also introduced me to the works of Rosemary Gladstar and made my first correspondence course possible! ~Chuck, who always challenged my intellect and my preconceived notions of myself. He made my first two semesters at PRC possible. Told you I could handle a college course load Chuck! But you already knew that… didn’t you? There are SO MANY more people than this that I would like to send my gratitude to. It seems the world has conspired to surround me by amazing, inspiring and supportive people in this lifetime. My friends… old, new, and everywhere in between. My various bosses, who all managed to support me in becoming what I wanted to become. Families of my friends, who always cared for me as much as their own kids. And relatives, who were always one huge group of cheerleaders. I want to acknowledge that so many people in life have not gotten the same privileges, freedoms, and support as me. Whoever you are, know that you have my support in reinventing yourself, following your dreams and goals, and getting through and surviving in this wild world. I hope to use my privileges to be the change I want to see in the world, and to support others who may not have been as lucky. Keep on living and letting your being make the world a better place!